[01.22.09] Are Seo In Young and Crown J Dating? Yes, yes, as we all know We Got Married is coming to a slow and painful demise. With the desperate additions of two overweight, goofy comedians and total public trainwrecks (Old Man Junjin and I’m-going-to-publicly-run-my-mouth Taeyeon), it’s pretty much over. However, there is speculation that WGM may be continuing in the sense of the Witch and the Ant dating in real life. Crown J dropped the P-word when presenting his soon to be ex-wife with 321 red roses, one for each day they were married. I don’t know about a lot of guys mentioning the word “propose” other than “Oh you want a proposal? Okay I ‘propose’ you get me another beer…” from my ex-boyfriends. Well, he still has her other shoe so we’ll just have to wait and see what new summer shenanigans these two cook up. I bet they’re aiming to get their own spinoff show, those two attention whores. A! Rumors spread today that Crown J and Seo In Young would leave “We Got Married” but it has been swiftly denied by their management. According to the PDs, the couples that will exit the show will develop their solo careers along different paths. With the farewell vacation mission broadcast showing over the next two weeks starting this weekend, many are concerned over who would leaving together with Andy and Solbi couple. Apparently, journalists have jumped the gun, fabricating stories and assumed that Crown J and Seo In Young would be leaving the show. They must have felt something was brewing with their “cold war” over a bowl of ramen with egg in the last episode which seems to be hinting at their eventual “split”. The PDs of “We Got Married” had expressed that 8 months seems to be a much too lengthy period and in order for the program to develop better in future, an infusion of new faces is required constantly for the novelty factor. Star Empire released a statement saying that they haven’t talked to the PDs at all about In Young’s possible departure or even thought about it at all. They also said angrily that even if In Young was to leave “We Got Married”, shouldn’t the PDs have consulted the person in question instead of through the media. Crown J’s management also released a statement saying the same thing, that they have not heard anything from the PDs about him leaving the show. Crown J has also posted on the Ant Couple Cyworld Club that the rumours about them leaving are untrue and that no one has heard anything about departing from the show. He also mentioned that he has given In Young a burnt copy of his new album (which hasn’t actually been produced yet). Their mere presence, mannerisms, “A!”, “Too Much” song, etc (I could go on and on…) would be sorely missed. Not everyone’s cup of tea, but their interaction was one of it’s kind and the program certainly needed them to act as a sharp contrast to the other couples. Thankfully, they are not leaving yet. Still cloudly outlook with regards to Alshin and JoongBo couples future. Just like what the PD said earlier, all four original couples with the exception of one have finished filming their farewell vacation mission on 16th September. As Kim Hyun Joong is still recovering from his wrong consumption of sleeping pills, he was unable to film his mission on the 16th as scheduled. It was then postponed to 18th but DSP Entertainment decided to postpone it again and Hyun Joong will now film it on the 20th with his ‘wife’, Hwang Bo. The AnSol couple, who had already decided to leave the program, took a stroll in a park while sorting out their feelings developed as a fake married couple for last 8 months. Solbi got emotional and shed tears. 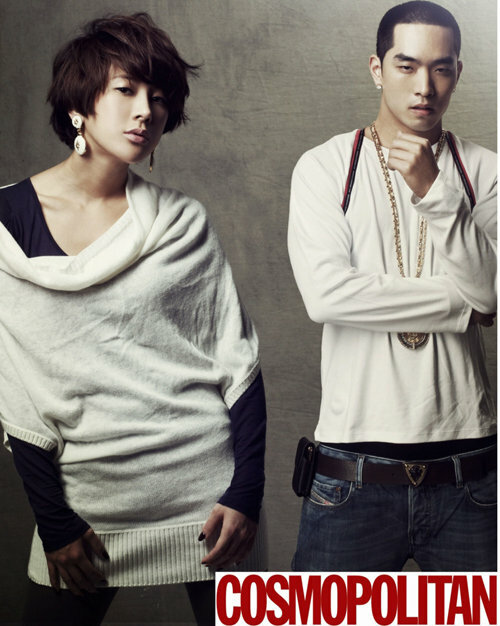 Andy and Solbi will leave the program completely after the last studio shooting on 23rd. Crown J and Seo In Young did what each of them wanted to do together, sports and shopping. Alex – Shin Ae had a different farewell vacation from the others. Shin Ae went to Ehwa Women’s University on the 7th to attend Alex’s first concert. The production team said, ” In the case of Alex Shin Ae couple, rather than a farewell vacation, they had a special event which led to a sentimental moment between the two.” The concert specifically had a bigger meaning since Alex missed his birthday party on 2nd September preparing for the concert. On a brighter note, the following pictures are Crown J and Seo In Young who displays a Bad Boy and Girl image respectively featuring for an Armani Exchange photoshoot. This will be published in October’s Cosmopolitan magazine. Starting from the 21st, ‘Se Pa Kui’ will go first during ‘Sunday Sunday Night’. ‘We Got Married’ will be switched to the second part instead. And there will be time change with 60 minutes (for the first part) and 90 minutes (for the second part). The second part of Alex – Shin Ae and Crown J – Seo In Young’s Childcare Diary as well as Andy – Solbi and Hyun Joong – Hwang Bo’s Farming Village experience will be aired this weekend. The studio recording for the couples’ ‘Farewell Vacation’ will be recorded on the 23rd and broadcasted on the 28th.